The average BDC had total returns of almost 20% in 2016 as predicted in my article from 12 months ago. However, BDCs are starting to dip and investors need to closely watch the yield curve that will likely drive upcoming volatility and pricing. BDCs are asset sensitive, not interest rate sensitive. 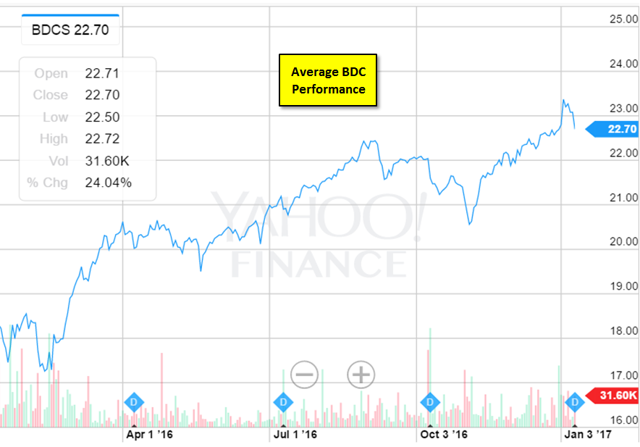 "I am predicting a BDC rally in late Q1 2016 and overall average returns of 17% in 2016." Business development companies ("BDCs") are popular among investors seeking sustainable dividend yields that are currently averaging over 10% annually. Most BDC investors realize that interest rates can impact pricing and volatility, but do not understand the reasons or what to look for. Lenders such as BDCs are driven by changes in net interest margins, which is the spread between interest income from assets and interest expense from borrowings. A flat yield curve is not a good thing for most BDCs, as they are asset sensitive. 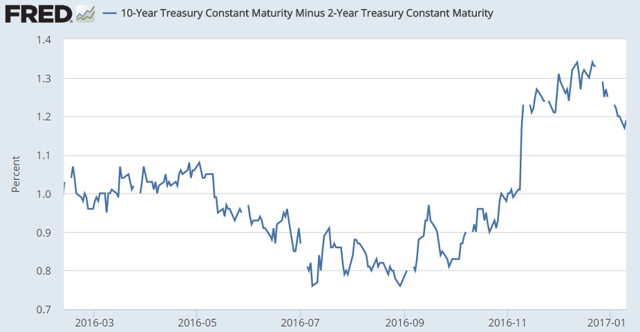 However, since late August 2016, we have finally started to see increases in the spread between 10 and 2-Year treasuries. This is a good thing for BDCs, and I will discuss in upcoming articles. Investors need to closely watch the forward yield curve as it is closely tied to the longer-term earnings potential for BDCs and will likely be responsible for BDC pricing in 2017. As mentioned in many of my previous "BDC Timing" articles, BDCs are volatile and timing is everything. For all previous articles on the timing of BDC purchases, pricing charts, dividend coverage tiers, risk rankings, suggested BDC portfolios, interest rate discussion, expense ratios, my upcoming/historical purchases and current positions, please see "Index to Free BDC Research." As mentioned earlier, since late August 2016, yield spreads were increasing. However, they are now starting to reverse course, and this has and will likely lead to lower BDC pricing if it continues. The following chart shows the recent BDC rally with a slight downtick recently. The results for 2016 are in, and the average BDC had a total return of almost 20% during the year after taking into account dividends paid. Explanation of total returns: The change in Stock Price assumes you purchased the stock at the end of 2015. Dividends do not assume reinvestment and are calculated using the amounts paid (or accrued) divided by the purchase price. 3-Year Total Returns: It should be noted that using a longer term of at least three years would produce very different results. I will cover this in a follow-up article. BDCs such as Main Street Capital (NYSE:MAIN), Monroe Capital (NASDAQ:MRCC), TPG Specialty Lending (NYSE:TSLX), FS Investment Corp. (NYSE:FSIC-OLD), TCP Capital (NASDAQ:TCPC), Gladstone Capital (NASDAQ:GLAD), PennantPark Floating Rate Capital (NASDAQ:PFLT), New Mountain Finance (NYSE:NMFC), Ares Capital (NASDAQ:ARCC), and Golub Capital BDC (NASDAQ:GBDC) are among the top-performing BDCs since December 31, 2013. The worst-performing are KCAP Financial (NASDAQ:KCAP), Medley Capital (NYSE:MCC), and Fifth Street Finance (NYSE:FSC). Clearly, the big winners were PennantPark Investment (NASDAQ:PNNT) and GLAD that were previously beaten down due to oil-related exposure. Apollo Investment (NASDAQ:OTC:AINV) was outperforming before its dividend cut in August 2016. Safer BDCs continue to outperform the average including MAIN, PFLT, TCPC, MRCC, ARCC, TSLX, Goldman Sachs BDC (NYSE:GSBD), and Hercules Capital (NASDAQ:HTGC), even after taking into account lower dividend yields. Higher yield BDCs such as Prospect Capital (NASDAQ:PSEC), TICC Capital (NASDAQ:TICC), Fidus Investment (NASDAQ:FDUS), and Capitala Finance (NASDAQ:CPTA) have also outperformed the average. TriplePoint Venture Growth (NYSE:TPVG) and Horizon Technology Finance (NASDAQ:HRZN) both underperformed that average and likely related to a slow IPO market in 2016 as they both lend to VC-backed tech companies that rely on IPO and M&A activity for valuations and liquidity. BlackRock Capital Investment (NASDAQ:BKCC) was the worst performer and investors are likely concerned about legacy portfolio credit issues continuing to put pressure on dividend coverage as well as upcoming incentive fees that will begin in the March 2017 quarter. 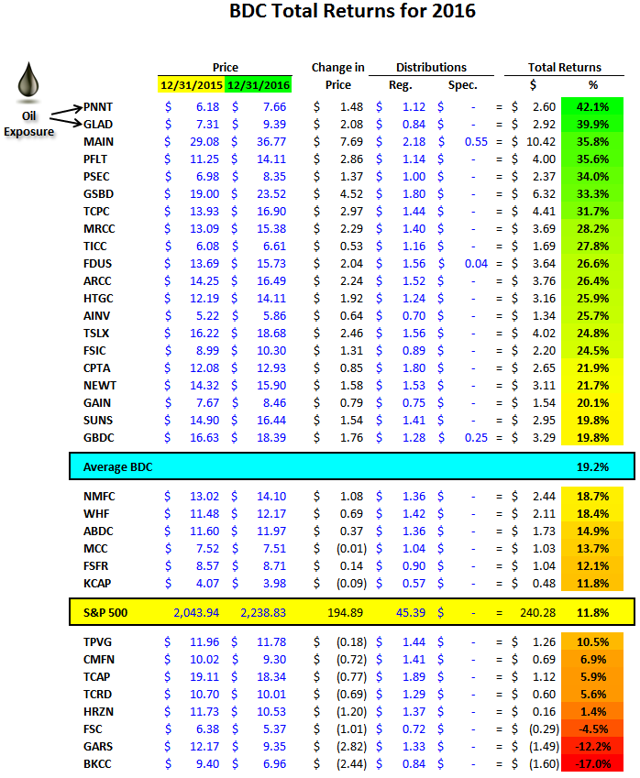 Garrison Capital (NASDAQ:GARS), CM Finance (NASDAQ:CMFN), THL Credit (NASDAQ:TCRD), Triangle Capital (NYSE:TCAP-OLD), and HRZN were among the 12 or so BDCs that cut dividends in the last 12 months which likely contributed to underperforming the average. Disclosure: I am/we are long ABDC, AINV, ARCC, BKCC, FDUS, FSC, FSFR, FSIC, GAIN, GARS, GBDC, GLAD, GSBD, HCAP, HTGC, MAIN, MCC, MRCC, NMFC, PFLT, PNNT, PSEC, SLRC, SUNS, TCAP, TCPC, TCRD, TPVG, TSLX. I wrote this article myself, and it expresses my own opinions. I am not receiving compensation for it (other than from Seeking Alpha). I have no business relationship with any company whose stock is mentioned in this article.